A country that spends and spends and spends and does not tax sufficiently will eventually run into debt-generated trouble. Its nominal interest rates will rise as bondholders fear inflation. Its business leaders will hunker down and try to move their wealth out of the corporations they run for fear of high future taxes on business. Real interest rates will rise because of policy uncertainty, and make many investments that are truly socially productive unprofitable. When inflation takes hold, the web of the division of labor will shrink from a global web he'd together by thin monetary ties to a very small web solidified by social bonds of trust and obligation--and a small division of labor means low productivity. All of this is bound to happen. Eventually. If a government spends and spends and spends but does not tax sufficiently. But can this happen as long as interest rates remain low? As long as stock prices remain buoyant? As long as inflation remains subdued. My faction of economists--including Larry Summers, Laura Tyson, Paul Krugman, and many many others--believe that it will not. As long as stock prices are buoyant, business leaders are not scared of future taxes or of policy uncertainty. As long as interest rates remain low, there is no downward pressure on public investment. And as long as inflation remains low, the extra debt that governments are issuing is highly-prized as a store of value, helps savers sleep more easily at night, and provides a boost to the economy as it assists deleveraging and raises the velocity of spending. [T]he relationship between government debt and real GDP growth is weak for debt/GDP ratios below a threshold of 90 percent of [annual] GDP. Above 90 percent, median growth rates fall by one percent, and average growth… more… in [both] advanced and emerging economies…. [In] emerging markets… [w]hen external debt reaches 60 percent of GDP, annual growth declines by about two percent…. 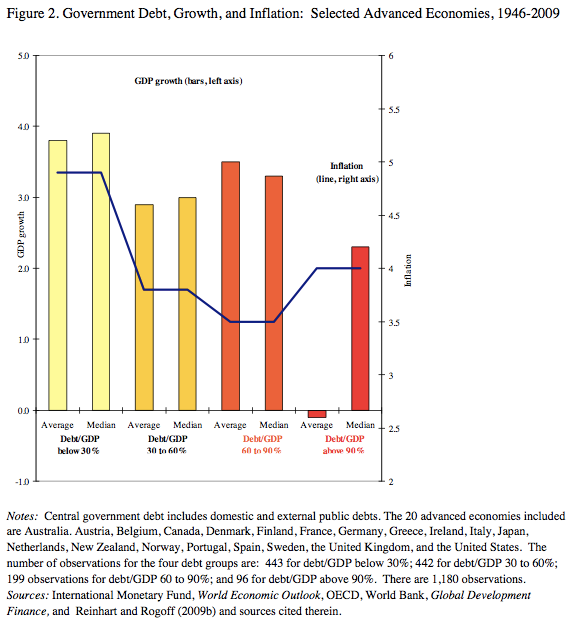 [T]here is no apparent contemporaneous link between inflation and public debt levels for the advanced countries…. The story is entirely different for emerging markets, where inflation rises sharply as debt increases. The principal mistake Reinhart and Rogoff committed in their analysis and paper--indeed, the only significant mistake in the paper itself--was their use of the word "threshold". It misled European Commissioner Olli Rehn to claim that "when [government] debt reaches 80-90% of GDP, it starts to crowd out activity in the private sector and other parts of the economy." Both of these--and a host of others--think that if debt-to-annual-GDP is less than 90% (or, in Rehn's case, 80%, and I have no idea where the 80% comes from) an economy is safe, and that only if it is above 90% is the economy's growth in danger. And in their enthusiasm when they entered congressional briefing mode it led Reinhart and Rogoff themselves astray. Johnny Isakson, a Republican from Georgia and always a gentleman, stood up to ask [Reinhart and Rogoff] his question: "Do we need to act this year? Is it better to act quickly?" Yet the threshold at 90% is not there. In no sense is there empirical evidence that a 90% ratio of debt-to-annual-GDP is in any sense an "important marker", a red line. That it appears to be in Reinhart and Rogoff's paper is an artifact of Reinhart and Rogoff's non-parametric method: throw the data into four bins, with 90% the bottom of the top bin. There is, instead, a gradual and smooth decline in growth rates as debt-to-annual-GDP increases. 80% looks only trivially different than 100%. There is no 90% threshold. Making policy under the belief that risks at 100% are very different than risks at 80% is in no way supported by any of the data. How much of this decline in growth as debt rises is cause for fear? Correlation, after all, is only sometimes causation. A good deal of this decline comes from countries where interest rates tend to be higher and the stock market tends to be lower where government debt is higher. That is not relevant to the U.S. today. A good deal of this decline comes from countries where inflation rates are higher when government debt is higher. That is not relevant to the U.S. today. Still more of this decline comes from countries where growth was already slow, and high government debt relative to GDP is, as Larry Summers constantly says, a result not of the numerator but of the denominator. That is not relevant to the U.S. today. How much of this correlation is left for a country with low interest rates, low inflation rates, buoyant stock prices, and healthy prior growth? We need to know that before we can even begin to analyze causation. The argument [for fiscal contraction and against fiscal expansion in the short run] is now: never mind why, the costs of debt accumulation are very high. This is the argument made by Reinhart, Reinhart, and Rogoff: when your debt to annual GDP ratio rises above 90%, your growth tends to be slow. This is the most live argument today. So let me nibble away at it. And let me start by presenting the RRR case in the form of Owen Zidar's graph. First: note well: no cliff at 90%. Second, RRR present a correlation--not a causal mechanism, and not a properly-instrumented regression. There argument is a claim that high debt-to-GDP and slow subsequent growth go together, without answering the question of which way causation runs. Let us answer that question. And the answer is that the bulk of causation is not there, and provides no reason for the U.S. to fear. The third thing to note is how small the correlation is. Suppose that all of the correlation is causation from higher debt to slower growth. Let us then consider two cases: a multiplier of 1.5 and a multiplier of 2.5, both with a marginal tax share of 1/3. Suppose the growth-depressing effect lasts for 10 years. And suppose that we boost government spending by 2% of GDP. Let us boost government spending for this year only in the first case. Output this year then goes up by 3% of GDP. Debt goes up by 1% of GDP taking account of higher tax collections. This higher debt then reduces growth by... wait for it... 0.006% points per year. After 10 years GDP is lower than it would otherwise have been by 0.06%. 3% higher GDP this year and slower growth that leads to GDP lower by 0.06% in a decade. And this is supposed to be an argument against expansionary fiscal policy right now? The 2.5 multiplier case is more so. Spend an extra 2% of GDP over each of the next three years. Collect 15% of a year's extra output as a plus in the short run. Taking account of higher tax revenues, debt goes up by 1% of GDP, and we have the same ten-year depressing effect of 0.06% of GDP. 15% now. -0.06% in a decade. The first would be temporary, the second is permanent, but even so the costs are much less than the benefits as long as the economy is still at the zero lower bound. And this isn’t the graph that you were looking for. You want the causal graph. That, worldwide, growth is slow for other reasons when debt is high for other reasons or where debt is high for other reasons is in this graph, and should not be. Control for country and era effects and Owen reports that the -0.06% becomes -0.03%. As Larry Summers never tires of pointing out, (a) debt-to-annual-GDP ratio has a numerator and a denominator, and (b) sometimes high-debt comes with high interest rates and we expect that to slow growth but that is not relevant to the North Atlantic right now. If the ratio is high because of the denominator, causation is already running the other way. We want to focus on cases of high debt and low interest rates. Do those two things and we are down to a -0.01% coefficient. We are supposed to be scared of a government-spending program of between 2% and 6% of a year's GDP because we see a causal mechanism at work that would also lower GDP in a decade by 0.01% of GDP? That does not seem to me to compute. True, but the 90% red line seemed to say there is nothing more important than moving debt down relative to GDP (though Ken and Carmen would probably acknowledge that faster growth, say through some even more forceful unconventional monetary policy, was a legitimate means to do that).